Steel is strong enough to support skyscrapers and trains. Aluminum is light enough to be picked up by hand. It’s no wonder, then, that manufacturers are welding and metal joining to build strong-fuel efficient vehicles. Some have even developed durable, all-aluminum frames. The growing use of aluminum in vehicle manufacturing is an important trend for anyone curious about welding to watch. Could you imagine one day working with these welding technologies? In the last 30 years, advances in joining and materials processes have made using aluminum in vehicles less expensive for manufacturers. More and more automakers, and even the military, have incorporated aluminum into their vehicles in recent years. In 2014, Ford swapped out 1,000 pounds of steel for 600 pounds of aluminum for its 2015 F-150 truck. Weighing in at only 700 pounds, the F-150 improves fuel efficiency by 5 to 29 percent. It also reportedly handles accelerating and breaking better. But is the all-aluminum F-150 as safe as its steel counterpart? Yes! Since aluminum is lighter than steel, Ford used more of it to make a thicker frame. The new body is sturdy and more resistant to dents. Instead of using spot welding, mechanical fasteners and industrial adhesives are employed to join the aluminum parts of the new F-150. General Motors has the fourth-largest output of vehicles in the world, putting nearly eight million on the road annually. The company’s fierce rivalry with fellow American auto manufacturer Ford has led to innovation and new designs, such as GM’s incorporation of aluminum in steel auto bodies in 2008, which helped reduce fuel consumption by 25 percent. Ford has devoted entire factories to building an aluminum F-150 pickup truck. GM, not to be outdone, started welding together aluminum and steel reinforced parts for sedans, SUVs and even luxury vehicles in 2016.
International steel-based technology company Voestalpine AG first developed a complex process for welding aluminum and steel in 2015, but it was too expensive for widespread application in the auto industry. GM found a more streamlined approach, rolling out a whole new welding system for its hybrid-steel-aluminum vehicles. The sheets of aluminum used for doors, hoods and tailgates are spot welded. Thsi technique allows GM to produce vehicles that are not only lighter but also cheaper, passing the savings on to the customer in turn. GM Lightweight Material Lab Processing Manager Blair Carlson says that spot welding can save millions of dollars because it can be done anywhere with standard tools. When you think of lightweight, fuel-efficient vehicles, Humvees and tanks probably don’t come to mind, do they? But that’s exactly what the U.S. military wants. Its researchers just developed a new technology to make it happen: friction stir dovetailing. This new technique combines elements of welding and carpentry. 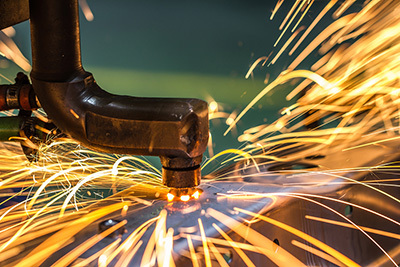 In welding, heat is often used to melt metals, making it easier to shape and bond them to other metals. A dovetail in carpentry is similar to that process: two pieces of wood are fitted into an interlocking joint that resembles a dove’s tail. With friction stir dovetailing, a dovetail groove is mechanically cut into a piece of steel. A tool with a spinning head is applied to the aluminum, heating the metal through friction so it can be formed to fit into the dovetail grove. Finally, the tool is used to heat the bottom of the dovetail to form a thin metallurgical bond, which serves to glue the metal together in the joint. As these advancements in welding and joining aluminum show, vehicle manufacturing has come a long way from the Model T—and it continues to change. With these technical innovations comes the need for workers to update their skillsets. For instance, more partial- or all-aluminum auto bodies means a greater demand for strong aluminum welding skills in repair shops. Those with the right skillsets could have a competitive advantage over technicians with less training. And those who keep their skill sets current with the latest technologies and relevant post-secondary technical training are the candidates who employers are looking for. Welding school can be the first step toward a career joining metal for the military or major automakers. Discover more about what you could learn in welding school.